Our featured item this week is the so-called "sprawl tax", which I argue against in the Chronicle here and on local KPRC TV here (I start at 1:15). I always struggle to keep my answers crisp in these interviews, but they worked a miracle in editing, distilling 10 minutes to 12 seconds, lol. In short, I object to the label – sprawl tax – because it implies you have no choice (taxes are not voluntary). In these cases, people are explicitly *choosing* to live further out, whether for a bigger, more affordable house or better neighborhoods or schools. They’re voluntarily making that tradeoff. People are accepting this cost they calculate to get those benefits. In every city they could choose to live closer to work, but that house might be smaller/older/more expensive/worse schools. It makes about as much sense as calculating a “luxury car tax” for those who choose to buy a BMW, Mercedes, etc. “Why are they choosing to do that when they could buy a Toyota Corolla for much less! ?” Kinda obviously absurd when stated that way. 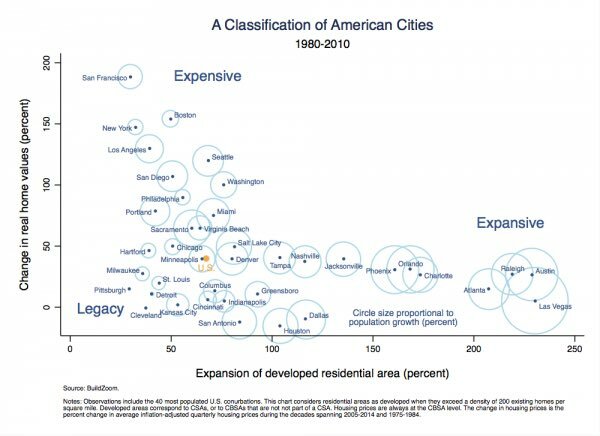 I’ll also note that the big metros that are low on their sprawl costs also have some of the highest housing costs in the country – those people are definitely not living at a lower cost. Maybe someone should calculate a “urban housing tax” or “smart growth tax” for metros that restrict new development and push up prices? Dallas Observer: DART Has Spent $5 Billion on Light Rail. Is It Worth It? Short answer: No. $5.1 billion spent with essentially no change in overall ridership and very little transit-oriented development to show for it. I have my disagreements with METRO's approach to light rail as well, but thank goodness we didn't do anything as stupid as Dallas. We were much smarter to focus the light rail on a short busy corridor in the core and keep using HOV buses for long-distance commuting serving multiple job centers. Finally, despite some recent questioning of the value Houston's lack of zoning, we've recently gotten some great outside recognition for the strength of approach from both Bloomberg and Market Urbanism. "Houstonians do seem to understand a basic economic truth that many people in other cities have a remarkable amount of trouble getting their heads around -- that allowing more housing to be built makes housing more affordable." He also has a companion piece, "They Know How to Build Apartments in Houston"
"If developers are building lots of apartments in and around Dallas and Houston, it's because they think they think there's demand. Some of that demand is about living close-in, in walkable neighborhoods with public transportation close by. Yes, even in Houston, that's becoming a thing. But a lot of it is surely just demand for housing that a non-wealthy person can afford. Houston and Dallas have been building lots of it. Despite strong job growth in recent years, San Francisco, San Jose and the cities around them have not. That's partly because they're already more tightly packed than Houston and Dallas, and face geographical limits on expansion that Texas cities generally do not. But it's also just because it's so danged hard to get permission to put up apartment buildings there. Which is a shame." Lastly, Nolan Gray at Market Urbanism has written one of the best pieces I've ever seen on Houston's approach to development: "Houston’s Beautiful (Yet Partial) Embrace of Market Urbanism". Here's one good excerpt, but it's packed with them and I highly recommend reading the whole thing. 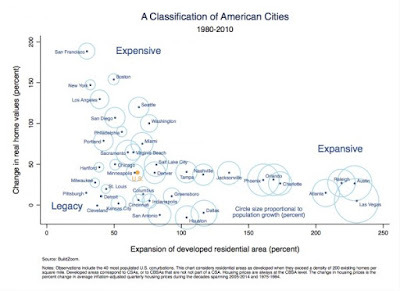 "Contrary to conventional wisdom, many US cities have a lot to learn from Houston. With tight development restrictions, out-of-date urban planning regimes, and burdensome regulations forcing middle- and lower-class Americans out of West Cost and Northeastern cities, Houston’s mix of affordable housing and economic opportunity is more valuable than ever. As other cities have attempted to maintain tight, centralized control on urban and economic development - exemplified by a recent push by Dallas to shutter local businesses in order to attract chains - Houston has opted to take a back seat to residents, entrepreneurs, and civil society groups in cultivating economic development and crafting urban communities... It is well past time that we start taking Houston’s success seriously." I'm heading to California on business for two weeks - not sure if I'll blog again before July. "There are two kinds of places that are getting it right... The second kind of cities we might call Joel Kotkin cities, after the writer who champions them. These are opportunity cities like Houston, Dallas and Salt Lake City. These places are less regulated, so it's easier to start a business. They are sprawling with easy, hodgepodge housing construction, so the cost of living is low. Immigrants flock to them. As Kotkin and Tory Gattis pointed out in an essay in The City Journal, Houston has been a boomtown for the past two decades. It's America's fourth-largest city, with 35 percent metro area population growth between 2000 and 2013. It's the most ethnically diverse city in America and has had a surge in mid-skill jobs. Houston's diversified its economy, so even the energy recession has not derailed its progress." I was able to attend a METRO blogger luncheon last week with the new chairwoman, Carrin Patman. It was clear she had done her homework reading up on us and that resulted in a productive exchange of ideas. They've begun work on a new regional transit plan, and I'm cautiously optimistic it will go in a more realistic, cost-effective, future-oriented (i.e. autonomous vehicles), and less rail-centric direction than what I saw last month. If we're really lucky they'll get innovative with the coming new technologies, but that's pretty rare for government agencies that are usually more comfortable being a follower than a leader - with the refreshing recent exception of the bus network re-imagining (maybe the first of a forward thinking trend?!). You can read more about it here. "And then there's this from Tesla CEO Elon Musk. At a transportation conference in Norway last month, Musk mentioned that his engineers are working on a self-driving bus-like vehicle that would help address urban congestion. He added that it could offer better service than transit buses because it would take people all the way to their actual destinations. No further details have been disclosed." "The article says that cities shouldn’t hesitate to build light rail just because self-driving cars are about to make transit completely obsolete. In fact, light rail is the accident waiting to happen. In 2012, light-rail trains killed 40 people in the process of carrying less than 2.5 billion passenger miles; that’s more than 16 fatalities per billion passenger miles. In the same year, vehicles on urban roads and streets killed 7.7 people per billion vehicle miles, which at 1.67 persons per vehicle (see table 16) is less than five per billion passenger miles. The goal of Volvo and other self-driving car companies is to reduce that by 90 percent or more." Kinder on the myth that gentrification is bad for existing residents. How zoning rules are helping Houston overtake Chicago as America's 3rd-largest city (arguable, see page 5). It may surprise you to hear that Houston does surprisingly well on this world ranking of best cities for traffic (among peer cities of a similar size). The lesson is that investing in freeways actually does help. Even if they do fill up again, they move more people than they used to and are in free-flow more of the day than they otherwise would be. Houston ranks a very respectable 12 out of 15 cities on this list of 'The Income Needed to Pay Rent in the Largest U.S. Cities', with only Riverside, Phoenix, and Detroit being cheaper. Harris County #4 in the nation for most new establishments, #2 for adding jobs.